The added value of d… on Open up! KU Leuven, Maurits Sabbe Library, Bible of Anjou, Naples, 1340, fol. 208r, detail, King Robert of Anjou, King of Naples, receives a book from a scribe, right the added heraldic emblem of one of the first owners of the Bible, Nicollo d’Alifio. 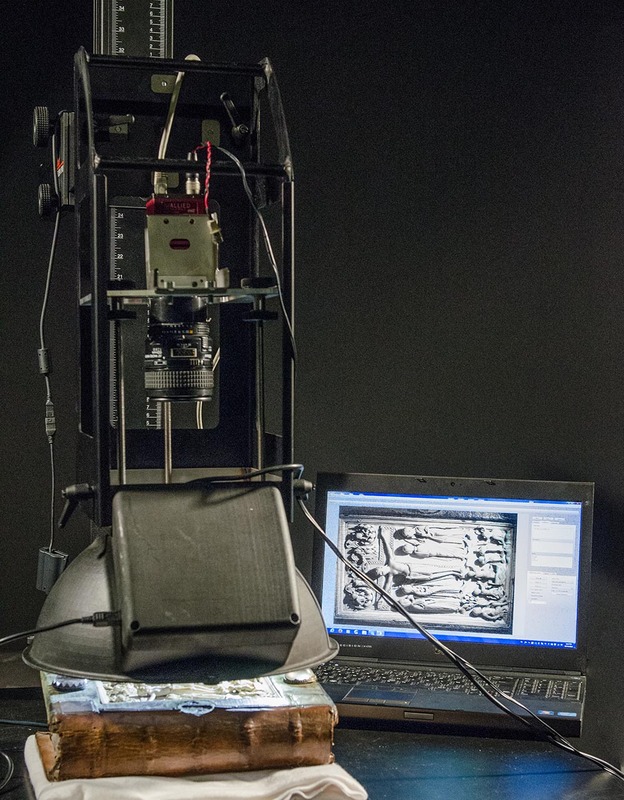 Apart from the digitisation of the documentary heritage of the University Library, the Imaging Lab is also the home of various projects on art-technical imaging. These projects are developed in close cooperation with researchers. A fine example is the RICH project (Reflectance Imaging for Cultural Heritage). KU Leuven, University Library, Tabularium, 7A329, second quarter 16th century, SPES Binding, panel stamp on brown calf leather. Within the project an imaging tool for research, study, and exploration of the material characteristics of graphic materials produced in medieval and early modern times is developed. With the Microdome, the topography of medieval book illuminations, stamps, inks, seals and bookbinding stamps is visualized and monitored.